Couple of days back, received a forward on WhatsApp that the RTO fees has been hiked and penalties included in some areas, otherwise generally neglected by people. The MINISTRY OF ROAD TRANSPORT AND HIGHWAYS has issued a notification on 29th Dec 2017. 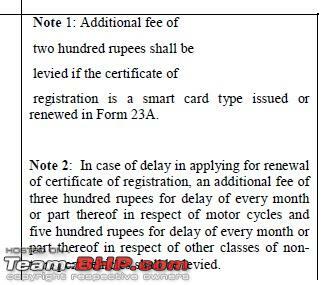 One such that caught my attention was a penalty of 300 a month for 2-Wheelers and 500 a month for 4-wheelers for delay in getting the Fitness Certificate renewed. 3) Some one who simply did not care to. You will find lot of such vehicles in rural areas. - A 2-wheeler fitness lapsed 10rs ago: Penalty-36000/-, 5 years green tax x2 + green tax for next 5yrs + prescribed fees. - A 4-wheeler fitness lapsed 10rs ago: Penalty-60000/-, 5 years green tax x2 + green tax for next 5yrs + prescribed fees. I myself have a 1973 Premier President that I want to restore and get the papers in order. I have to now rethink. Main reason for delay was, car is in a relatives name and he ahs expired. The original book is lost too. To get in order + restore wasn't an easy one, now add to it the penalty! In my honest opinion, the ministry of road transport should have warned or given some time for road users to get their papers in order. For now, I atleast hope, they collect penalty only for months past the circular and not for since when it has been due. If not, a lot of bikes and cars will get scrapped in coming days owing to the severe penalty. The enthusiasts will be vastly affected. The PDF of notification is attached. Last edited by funkykar : 13th January 2017 at 17:14. Mod note: Thread moved to Street Experiences. Yea - my 15 year old Fiero will need 5000/- to get documents in order while its market value will still be 15,000/-. This is a double whammy for enthusiasts. Seems like the government wants to scrap vehicles asap! Once published in the Gazette, isn't there generally a 5 yr period before implementation.